Nothing says fall like the combo of squash, kale and pomegranate. This salad is perfect for a potluck, and it’s even sweet enough to serve at brunch. On a sheet pan lined with parchment, toss the squash with a tablespoon of olive oil and season with salt and pepper. Roast for 30-40 minutes, giving the tray a shake occasionally, until the squash is tender and beginning to caramelize. Meanwhile, in a food processor combine all the ingredients for the dressing except the olive oil. Pulse to combine. Gradually add the olive oil while the processor is running. Season to taste. To plate, lay a bed of kale on a platter, or in individual bowls. 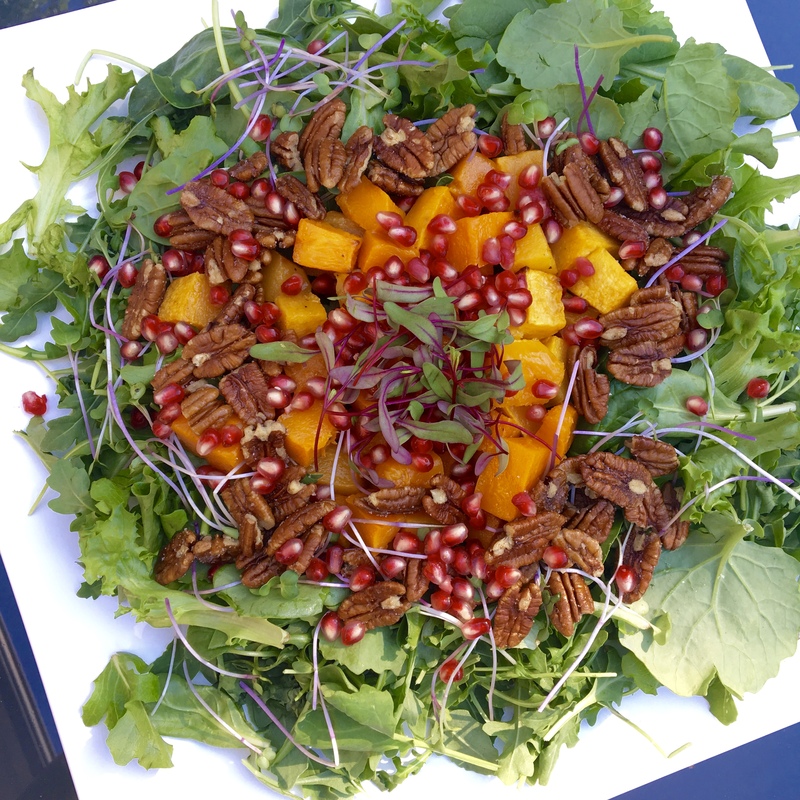 Place the squash on top then garnish with the pomegranate and pecans. Drizzle with the dressing. Serve and enjoy! To make candied pecans, melt 1-2 tablespoons butter in a non stick frying pan. Add the pecans and toss to coat. Add 1/8 cup sugar (brown or white) and stir to combine for one minute. Pour onto a baking sheet and let cool. The sugar will harden and the pecans will taste like candy!